Holland RV Fire from a driver's perspective. The 3-alarm multi-million dollar blaze at Holland RV wasn’t exactly a subtle sight Sunday, Oct. 11, and the investigation of its origins might add more heat to the situation. Sidewalk view of Holland RV fire. Fire was seen from Highway 78. Federal Alcohol, Tobacco and Firearms (ATF) agents entered the fray this week looking into a fire causing an estimated $3 million to $4 million in damage to the San Marcos RV center. 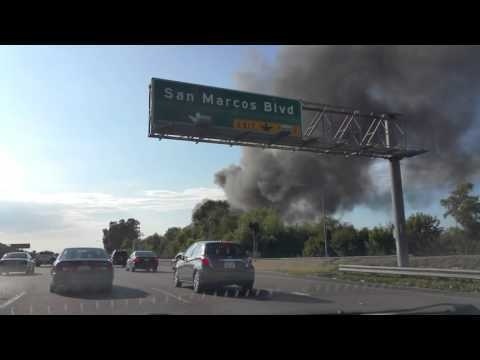 Smoke was seen across San Marcos and the Highway 78 corridor from Escondido to Vista and as far away as Rancho Santa Fe. 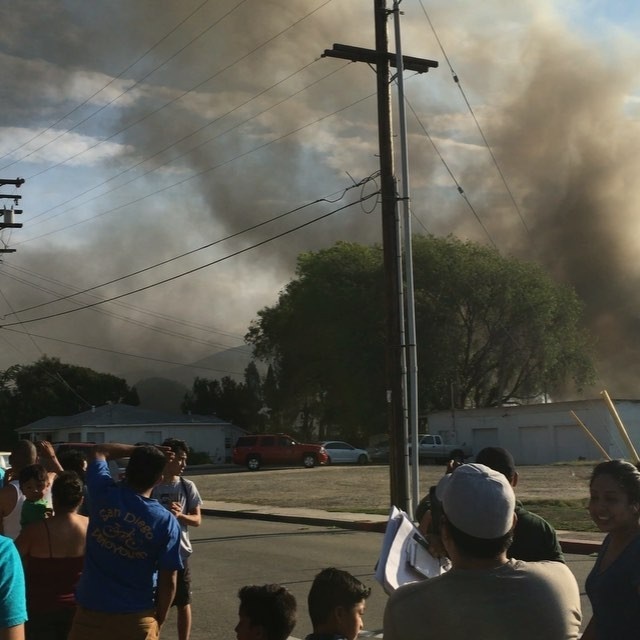 Explosions believed to be from propanes tanks rang out making the scene even more dangerous for the 100 firefighters who took about an hour to extinguish the flames at the 10,800-square-foot facility. Two firefighters suffered minor injuries and several RVs were damaged. The San Diego San Diego Sheriff’s Department’s Bomb Arson Unit and San Marcos Fire Department almost immediately looked for investigative help in examining the origins of the blaze. Sheriff’s Sgt. Greg Hampton and San Marcos Fire Chief Brett Van Wey said outside help was more than helpful. It was essential. This brought an 18-member ATF team to the Valley of Discovery this week to discover whether the fire was man-made or simply the residue of misfortune. Teams typically include veteran arson experts, forensic chemists, dogs trained to detect explosives and accelerants and forensic computer support. They work with local and state investigators to reconstruct the scene, identify the point of blast or fire origin, sift debris and conduct interviews. “We come with a blank slate, we make sure we don’t have some preconceived notion about what is going to happen,” said Steven Cordle, the ATF team supervisor. One of the curious aspects of the situation was the fact then dealership didn’t have sprinkler to confront a blaze while the dealership had numerous propane tanks and other combustible material. San Marcos officials said the dealership facility was built in 1996 before a city ordinance went into effect mandating internal sprinkler systems in commercial developments. Holland ownership reportedly were about to sign a temporary lease on a new space in Escondido to carry on with business. Holland Vice-president told reporters the dealership’s 11 employes and equipment could resume work without interruption.